Great book for young kids to read or to have read to them when getting ready to travel. Explains steps they will take. Good read. Read this review and more at The Bohemian Housewife BlogI've recently decided to commit to doing book reviews with my son. I talked about doing it in my blogger group but didn't commit to it. Seeing Anita @ I loves 2 read and Judith @ Platypire Reviews posts really motivated me to start up. Their children are a bit older than mine, so I'm helping my 3-year-old son with his reviews. We read books to him every day, and he always has something to say about them. I can't wait to watch his reviews grow!Pug with a Passport by Marie StoryPages: 46Ages: 1-6Rating: 5 Stars from both of us! Did you like this book?YES! It's so funnyWhy was it funny?Because the silly doggy was on a plane!What was your favorite part? When the door went BEEEEPPPP. He had money in his shoe! (TSA metal detector)Do you want to read this book again?RIGHT NOW? YES!I thought this children's book was the perfect addition to our preschool lesson for this week. We travel quite a bit, and he thought it was so funny that the dog was on the plane. He also asked if we could bring our dog next time, which made me giggle. I think this would be excellent for any parent that is taking their child on a trip. It's very descriptive and kept mentioning trying new things; As a mom with a picky eater, I appreciated that. This earns a 5-star review from us! Pug With a Passport has a lot of things about it I enjoyed. It tells a story that will entertain the kids and is full of great illustrations of the incredibly cute Pug, but it also does a lot more. It teaches and it inspires.If the family is planning a trip, a move or just a ride across town this is a great book for kids to read before. It features Pug as he tells the reader everything involved in his trip to see friends and family. Everything is explained in a fun, entertaining way that shows that despite the turmoil that can pop up with a trip or vacation, there are lots of helpful people to meet and new things to discover along the way.I enjoyed the story and the illustrations. The format is great and the story being told directly to the reader is a fun way to experience this trip. I'm looking forward to Pug's next adventure and I'm sure kids who read this will be too. Wow! This is just excellent! What a great way to introduce travel to foreign countries! And the illustrations are just too cute and perfectly match each point on each page! This book is beautifully put together and constructed well enough to go travelling as well. Every consideration seems to have been put into this book before publishing - from the instructions to obtain a passport, the process of the airport adventure, encouragement to delve into a countries customs and unique food choices besides just seeing the tourist sites, to the wonderfully appropriate illustrations and the amazing care and foresight of the sturdy construction so this book may withstand the journey of many travels. 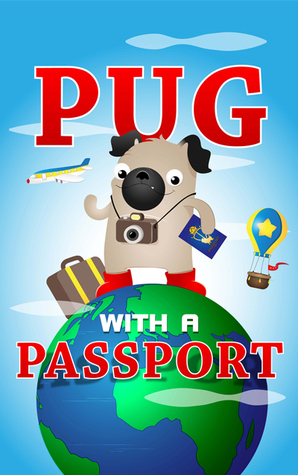 Pug with a Passport tells about the adventures of a dog named Kipling who is preparing for and taking a trip. It is a great picture book to teach young children about travel and cultures. I wished I had this book when I traveled by plane with my 3 year old son; when we went through the metal detector at the airport, the beeper went off due to a metal snap button on his clothing, and the security guard decided to check him separately, my son did not liked to be checked by a stranger! I wished I had prepared him for that, so he knew that the security guard just wanted him to be safe. This is an adorable introduction to travel. It's very simple, but it actually covers all the basics of taking a trip abroad - from getting a passport (including filling out an application and taking a photo) to packing, to airport security, etc. I'd never expect such a (normally) dull topic to be handled in such a cute, lively, entertaining way. I received this book from the author and Goodreads.This book tells the story of Kilping Pug, a pug that wants to travel. The language is simple and the sentences are short, so the kids won't have any problem trying to read this book by themselves.I found the story really funny and cute, and also the illustrations are adorable.I totally recommend it. 10/10. Kids will love it! Such a cute book! Loved it! What a fantastic little book.My 8 year old son loved it. (he has requested a book about a pug travelling to the moon..)Great book for teaching children about travel. Great little book for children who are of preschool or kindergarten age to prepare them for what will happen when traveling from one country to another. Pug is an adorable pup preparing to go on an adventure to meet new people, experience new places and eat new foods. He takes his young readers step by step from the planning stages including getting a passport, packing, going to the airport, passing through screening, checking in baggage, and experiences on the airplane. Then he reverses the process by detailing the landing, customs, meeting a friend, and the sights and sounds of the places he visits. We even learn about some ways to say the word, "Pug," a few of the different customs, and how to be polite to people in foreign lands. By the time Pug arrives home, he is already thinking about his next adventure.Colorful, simple illustrations combined with a large attractive font enhance the appeal of the story. Recommended for families to share with their young children before traveling, and as an introduction to cultures around the world. I LOVED the artwork in this book. The pug was adorable, the pages were bright and colorful, and it was definitely a book that I could read to my kids (when they were younger). The artwork definitely earned a solid five stars.I had to drop half a star from the review because of the narrative of the book. I didn't understand if the purpose of the book was:- To show how to get a passport- To teach kids about flying- To show the joy of traveling- To get kids interested in visiting other countriesThe narrative was grammatically correct and well-written, but I didn't understand the main theme of the book beyond "travel". It touched on a lot of topics, and felt a bit too broad. Great book for kids to learn about traveling from one country to another. This book tells step by step from the planning stages including getting a passport, packing, going to the airport, passing through screening, checking in baggage, and experiences on the airplane. Then he reverses the process by detailing the landing, customs, meeting a friend, and the sights and sounds of the places he visits. Colorful, beautiful illustrations. Recommended for families to teach kids before traveling, and as an introduction to cultures around the world. This is an adorable, fun way to teach kids about travel – and Kip is an awesome travel guide! It’s a great introduction to the concepts of travel and international culture. I’ll definitely be keeping an eye out for others in this series. The pictures were cute but the story was boring. I almost bought this before borrowing it and I'm glad I didn't.